Yeah, also getting all these sound sources out could be iffy, as I think you only have the ModDemix as a mixer. In a system this size, I'm wondering whether Maths is the best use of HP real estate, as you could for almost the same HP get an Envelope generator (you do want one of those) and a micro quad VCA. You also are going to need to power your rack, unless you have a built in power supply using no HP. Not sure why you would use a passive I/O module, but there are nice powered alternatives from Happy Nerding or 4ms. If you don't need the 4HP power, you could always throw a Disting MK4 in there. Actually, this has more problems than just not enough VCAs. For instance, why have two dual ring modulators when you only have two sound sources (Mangrove and W)? That's basically three ring modulators too many. The excess of those huge Just Friends modulation sources are a problem as well. And while the Meng Qi output stage isn't a bad idea per se, it also doesn't leave you any way to control your output levels. As for EGs, you actually have those with the Maths, albeit only rise/fall-type envelopes with a little extra trickery. The Just Friends works as these as well, but I've always viewed those as more LFO-ish. 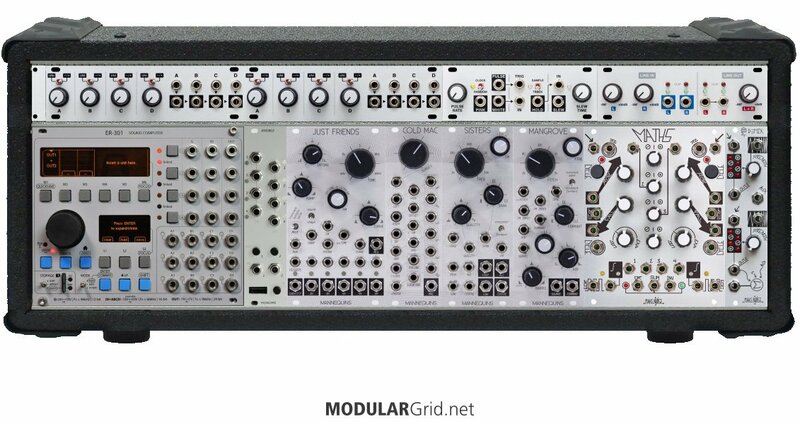 Anyway, the problem with the Maths is size; at 20 hp in this small a build, it hogs a lot of hp, then add to that the size of the Just Friends modules, and you've got more space being used for modulation than anything else. There seems to be an overall theme here; it seems as if much of this was done based on the "Top Modules" list instead of engineering the skiff build for maximum functionality, and while those are definitely good picks, they're good picks for a larger system. For a single row of 104 hp, you need to tackle the space problem as a primary issue. Lastly, the Monome noise issue. I'm going to venture a guess that the noise in question is hum, and that when you switch in the Meng Qi's ground lift, it goes away. If that's the case, you have a ground loop, and the fault isn't any of the equipment per se, but an issue with your synth and your mixer/DAW input/etc being on different grounds and they're trying to establish a ground path through your audio line. But if the noise issue is hiss/frizz/digital hash sounds, then the problem is actually in your connecting cable, and you need a USB cable that has a ferrite isolator on it.  But my guess leans very much toward the hum, as it's a lot more typical and the Monome Grid should be USB powered from the Ansible, if I remember right. A Konstant Labs power checker, for starters. There's an extra 1 hp left over, plus you seem to have some odd power issues, so this was a no-brainer. Then the Ansible. Next comes your Mangrove, W, and a 2 hp Sine which is a wavefolding sine VCO, added as a carrier for the ring modulator, which is in the next module along with a sample and hold, plus a slew gen. Last thing in this section is a 4 -> 1 2hp mixer. Modulation section got majorly revamped. 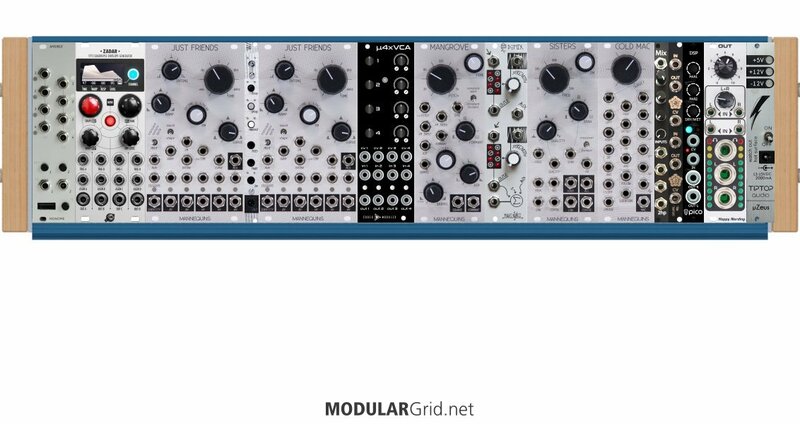 I went with Codex's 8 hp version of Mutable's Tides as a main LFO, then there's two PipSlopes, which are CVable AD generators with looping capability. Those do much of the same work as the VCS cores in the Maths. Four ADSRs under one panel are next with the Doepfer A-141-4, which allows you to change envelope values in a ganged fashion via CV. Taken altogether, that's actually a bit more going on than you'd find with a Maths. Then the Cold Mac goes next to these to allow complex interactions between modulation sources. Next are a pair of Tiptop's Steiner Synthacon VCFs. An incredible multimode with loads of character, having two allows you to split your audio and impose two different filter profiles onto that. Then a Dual VCA sums these down via its two-channel mixbus and sends this on to the Sisters for final formant filter manipulation. Then, a copy of the classic Moog CP3 mixer allows you to mix (with a touch of euphonic distortion, pretty much like the Minimoog's VCO mixer, based on the CP3) the Sisters with the Tiptop duo or your Meng Qi passive LPGs, if that's desired, and it goes on to the Erica DSP for effects and stereoization. Last, we have a Happy Nerding Isolator, which gives you a stereo pair of transformer-isolated 1/4" outs with a ganged stereo level control. This, to me, makes more sense. This not only accomplishes the same sort of functionality as your build, but adds a lot more functions and also, a lot more in the way of possible routings in both audio and modulation paths. And with the Monome gear, you now have plenty of things with which it can interact, making for a more elaborate instrument in terms of sonic potential. I'm assuming, also, that for mults you'll be using inline mult widgets of some sort, which is the best option in a space-limited build such as this.